A one-of-a-kind experience of the Las Vegas Strip in an open-air Jeep Wrangler. Your entertaining guide will highlight the famous landmarks from Fremont Street to the "Welcome to Las Vegas" sign. 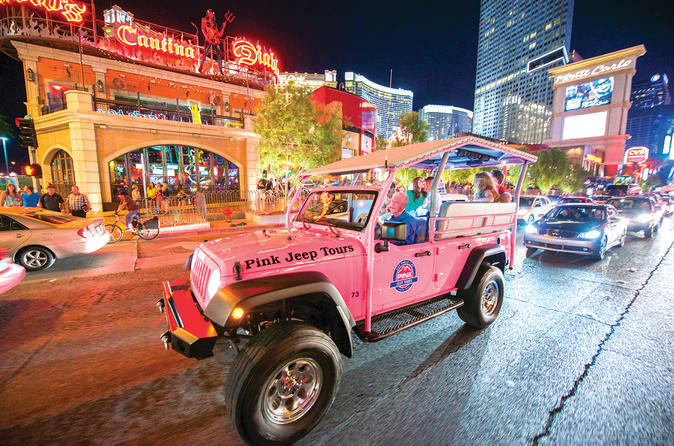 A one-of-a-kind guided experience of the Las Vegas Strip in an open-air Jeep Wrangler. This tour is at night so you can enjoy what Las Vegas is so famous for, the lights! An entertaining guide will highlight many of the most popular landmarks, including the famous "Welcome to Fabulous Las Vegas" sign, Wedding Chapel Row, Gold & Pawn Shop, and, of course, Fremont Street and all of its dazzling lights. See what has been termed "New" Vegas and compare to the history of what built this great city to the destination it is today. Be sure to bring your camera, you will find plenty of opportunities to take photographs to remember this one of a kind experience!